Denne model er 173 cm og bruger en størrelse S. Brystet måler 87 cm og taljen 71 cm. Cut to perfection. This versatile shape is perfect for any workout. These versatile tights can take you from the box to brunch and back again. High power interlock construction gives you total coverage and confidence during squats and the CrossFit specific fit is designed to move with you through any exercise. The chafe free construction teams up with the wide waistband for a smooth flattering fit so you can focus on your reps. 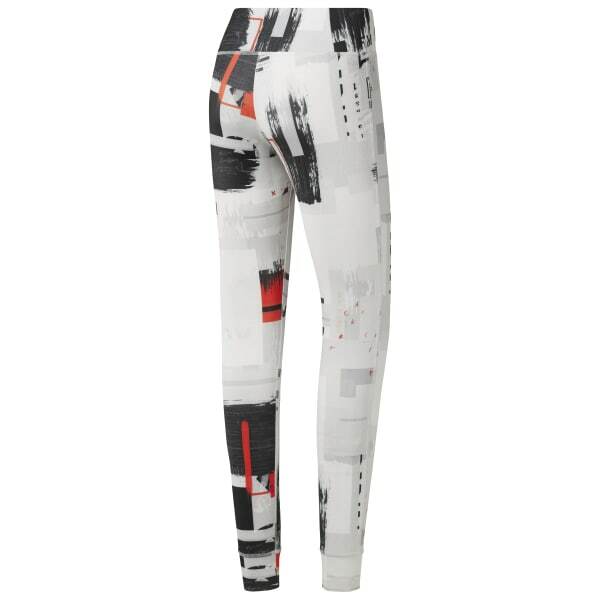 The digital print is a nod to the Bauhaus movement through the mash-up of assorted visual elements. The print incorporates Reebok's history in CrossFit and elements found in the CrossFit space.